Having a hard time deciding what to buy your friends or relatives this Christmas? Why not make them something instead! Everyone always says, "everything tastes better with bacon", why should chocolate be any different? You too can have this tasty snack in 5 easy steps. Imagine the jubilation when your friend/relative opens their presents to find Chocolate Covered Bacon! On a sunny day some friends and I had ordered some bacon cheese burgers for lunch. After a couple of bites someone commented on how bacon was able to make an already delicious hamburger even more delicious. This started a conversation on the power of bacon in-which it was able to make everything it came in contact with taste better. Whether itâ€™s a filet wrapped in bacon, bacon on salads, pizza, or sandwiches itâ€™s always that much better with bacon. We wondered if it was possible that any other foods had this special property. Someone quickly identified chocolate as a food with similar complimentary properties. Chocolate covered pretzels, strawberries, nuts, just about everything tasted better covered in chocolate. If both bacon and chocolate can make other foods taste better, what would happen if someone was just crazy enough to combine chocolate and bacon? A quick search on the internet yielded little information, which raised some serious concerns on the safety of combining two such powerfully substances. Several questions came to mind; maybe bacon and chocolate arenâ€™t supposed to be combined? Maybe combining them could start the apocalypse? With complete careless recklessness for ourselves and the rest of the planet we decided it had to be done. Iâ€™ve carefully documented the procedure for making Chocolate Covered Bacon (CCB) to serve as record incase I was killed during the combining process. If you are planning on following the outlined procedure listed below please proceed with EXTREME CAUTION. This documented procedure was performed in a controlled environment with all the necessary safety procedures. Please note: That no animals were hurt in this process (none that I specifically hurt, but I suspect the company that harvested the bacon might have). 2. Heat large skillet on high. 3. Add bacon strips to skillet. 4. Turn bacon strips over as needed with tongs. 7. 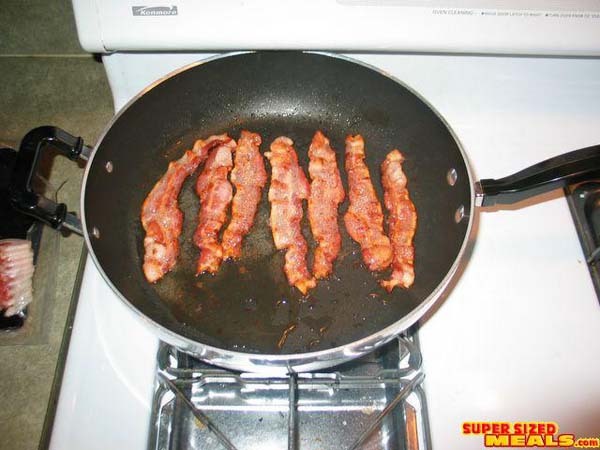 While the bacon is cooling fill the double boiler or medium sauce pan with water and bring to a medium heat. 8. 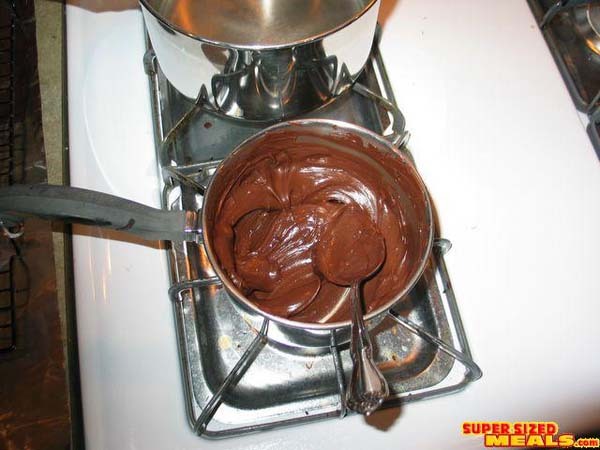 Place double boiler top pan in double boiler bottom pan or put the small sauce pan in the medium sauce pan. 10. Using your fingers or tongs carefully dip the bacon strips into the chocolate, if necessary use a spoon to spoon the melted chocolate over the bacon evenly coating it. 11. Once coated lay strips on cooling rack or cookie sheet. 12. 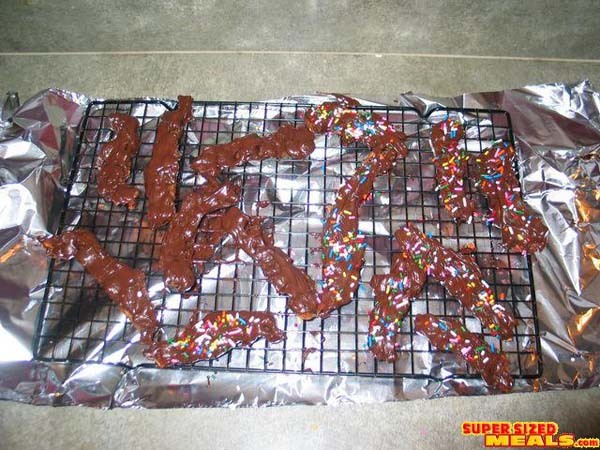 (Optionally) Apply Sprinkles evenly on chocolate covered bacon while on cooling rack. Itâ€™s important to apply while the chocolate is still warm. This will allow the sprinkles to better adhere to the chocolate. 13. 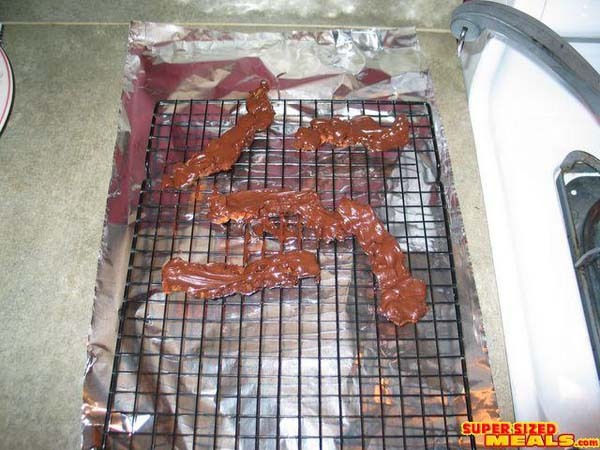 Place cooling rack with bacon into the refrigerator for 15 minutes. 14. 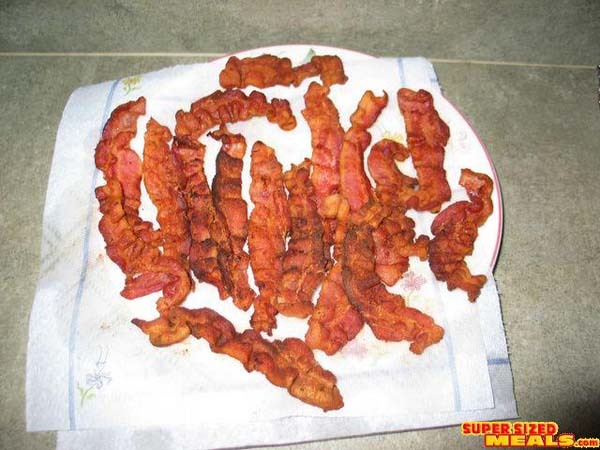 Carefully remove bacon strips from the cooling rack and place into a container or place the strips directly into your mouth. 15. Bring container with strips to work, school, or religious event. At this point you are probably wondering if Chocolate Covered Bacon (CCB) tastes good or is utterly disgusting. Perhaps you are asking yourself â€œWhy would anyone even consider this combination?â€� I suspect the person who suggested that orange juice might not just be for breakfast anymore was subjected to the same level of scrutiny. But it was exactly this type of forward thinking that tore down the walls and stereotypes about orange juice, and made it perfectly acceptable to consume anytime of the day. Billy, you are a GENIUS. I'm going to make this and I think I will try to brush the chocolate on with a pastry brush. Maybe a light coating first, cool until set and then apply another coat. What do you think? I think that would work, but the best way I think would be to fully dip the bacon in chocolate, let it cool, then dip again. You're guaranteed to get the thickest possible coating then, although you'd need a lot more chocolate to do it. Send in the pics, would be great to see how it turns out! Chocolate Bacon Recipe - with BaconSalt! Knowing my love of bacon, and being a canny Lancashire Lass, my wife whizzed up a trial using supermarket "value" brand chocolate and BaconSalt ("the spice that makes everything taste like Bacon"). It's amazing! The first batch was just 100grams, the second was 200 grams, and now we make it with 6 bars of chocolate at a time and fight over the last piece! We've also experimented with dark chocolate and the "Peppered" flavour BaconSalt - that's good too. And BaconSalt is sold in UK and Europe now at www.crazy4flavour.co.uk saving the cost and delay of postage from www.baconsalt.com USA/Canada. try mixing honey with the chocolate. that is really really tasty. I even tried a pinch of cyanne pepper in the mix and it came out quite well.